JOINT BASE LEWIS-MCCHORD, Wash. -- Low clouds and a light fog shroud the flightline as the Airmen wait indoors for their schedule for the day. It's a brisk, cold morning -- promising ice on the aircrafts blanketed in the mist. For aircrews, ice or snow on their jet can prove to be a major hazard, and before they can fly, maintenance Airmen must deice the aircraft four hours before takeoff to help mitigate those hazards. The wings and tail of aircraft scheduled to depart is coated in the deicing fluid, which is similar to antifreeze. "The purpose is to remove any unsafe flying condition caused by icing," said Senior Airman Douglas Mitchell, 62nd Aircraft Maintenance Squadron crew chief. "Any frozen contamination remaining on the horizontal stabilizer and other flight control surfaces can cause unknown aerodynamic characteristics which may render the aircraft unsafe for takeoff." To combat the cold, 62nd AMXS Airmen don protective layers. They step outside to find most of the clouds have lifted. 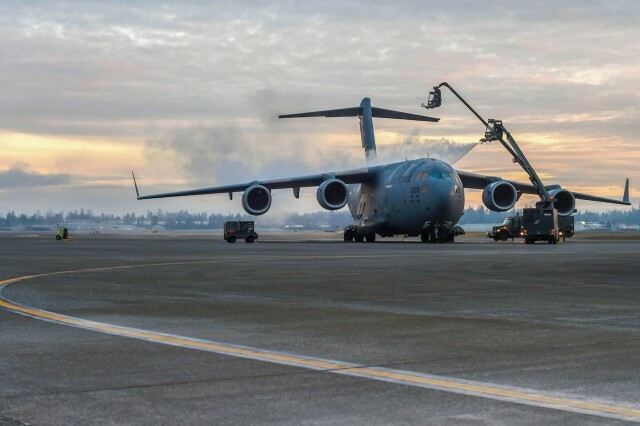 They load into two trucks and head for the C-17 Globemaster III they are tasked with deicing. "The ice makes (the aircraft) heavier and can freeze the flight controls," said Senior Airman Ian Bartlett, 62nd AMXS crew chief. "Any flight controls not being able to move properly can potentially affect the way that they fly. It can cause damage to the aircraft. That's kind of the name of our game: to make it safer for pilots to fly." 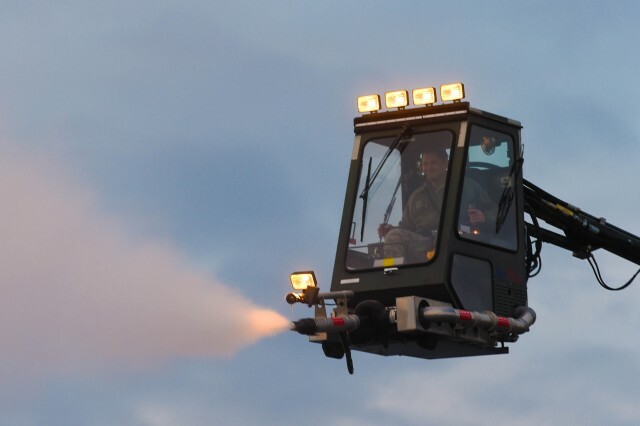 One Airman controls the bucket seat attached to an extendable lift on each truck that sprays the deicing fluid onto the jet. 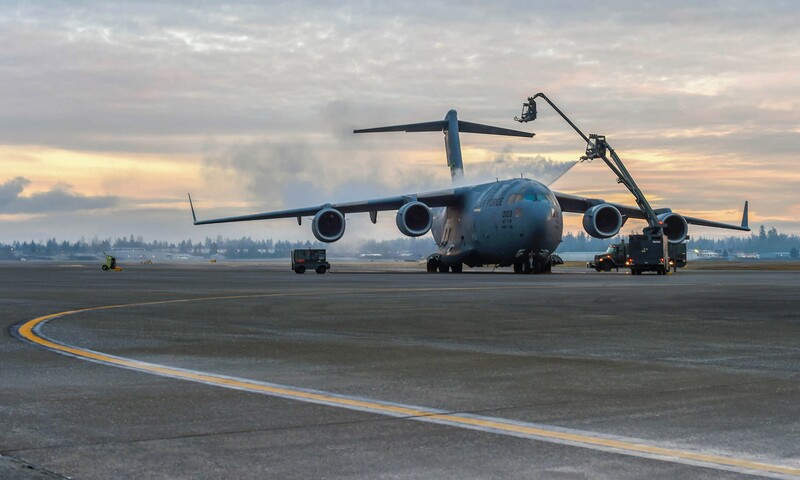 The process creates an orange mist that halos the C-17 as maintainers spray the tail and wings of the aircraft. The Airmen remain in constant communication with one another to ensure those in the buckets aren't getting to close to the jet and those in the trucks know where everyone is at all times. "Communicating with the other truck can be difficult because you want to make sure no one is out of the truck before you start spraying," Bartlett said. "The most difficult part is getting everything right, making sure you're not messing up." While the Airmen spray their final touches on the jet, the sun awakens over the horizon and casts its warming rays on the flightline and streaks pink and yellow clouds across the sky. Working together, the two teams have made quick work of their task that they call enjoyable. "I was saying to one of the new guys who was in the bucket with me earlier, it's kind of like playing a video game," Bartlett said. "You are shooting the liquid at a plane, it's kind of fun." This dedication to mission and enjoyment in execution helps drive Airmen innovation. As highlighted by the 2018 National Defense Strategy, cultivating a lethal, agile force requires more than just new technologies and posture changes; it depends on the ability of warfighters. The creativity and talent of the American warfighter is the nation's greatest enduring strength, one not taken for granted, and the maintenance Airmen are an example of that. 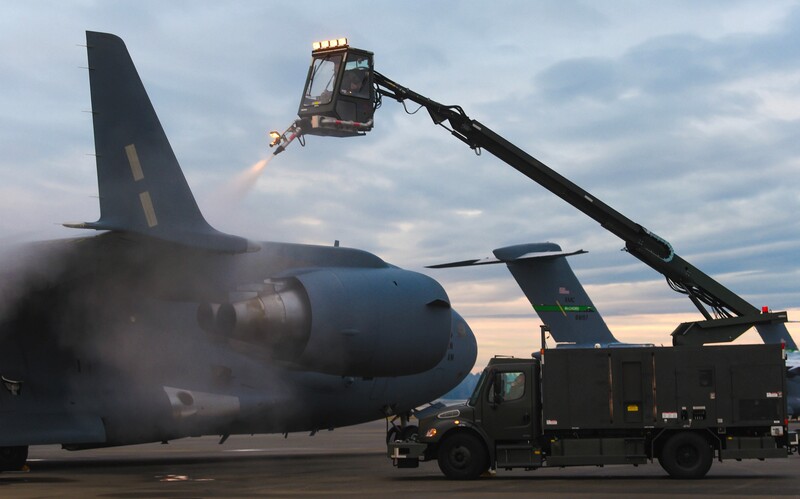 The talent of the Airmen who deice McChord's aircraft provide a vital tool for keeping McChord C-17s mission-ready. 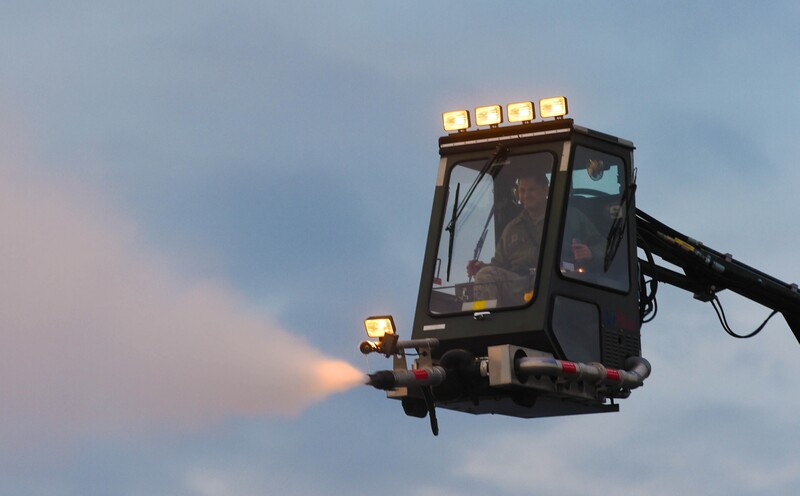 Maintenance Airmen demonstrate their skills and talent time and again. The sun is shining brightly as the Airmen in the buckets return to the ground and the trucks pull away. Another C-17 has been successfully deiced. The 62nd AMXS Airmen return to their building to see what other tasks are required in order to keep C-17s in the sky and ready to fly their next mission in support of rapid, global mobility.